A program for our higher donors, this membership was created to honor one of our most spirited patients. To keep pace with the cost of caring for increasing numbers of patients, starting January 1, 2017, Kellan Circle membership will increase to $500. 2016 Kellan Circle members will continue to receive Kellan benefits through the end of 2017 (benefits include the invitation to a donor release and a weekday private tour of the Center). If you have any questions, please contact Mitch Fong at fongm@tmmc.org, (415) 289-7353. 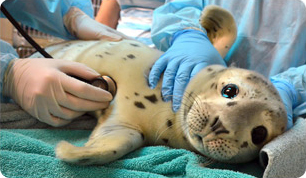 The Kellan Circle is named in honor of a young harbor seal pup that was found with a badly infected left eye. She was rushed to The Marine Mammal Center hospital where veterinarians determined that the eye would have to be surgically removed. Over time, with the care from our trained staff and volunteers, Kellan gained strength and even with just one eye, she was able to successfully track and catch fish (she was one of the best students in her class at "fish school!"). Through much determination and a vibrant spirit, Kellan was strong enough to be released back into the ocean – healthy and wild. Kellan Circle members enjoy more access to the Center and the opportunity to see first hand the release of healthy animals, like Kellan, back to their ocean home. Membership includes two cardholders and up to four guests. All Basic and Family Membership benefits. One personal tour of the Center in Sausalito during weekdays. Please call (415) 289-7335 to schedule. Special recognition in the Center's publications. Invitation to a summer Community Animal Release Celebration. Join now or renew your existing Kellan membership simply by clicking the buttons below and completing the online donation form. For further inquiries about Kellan Circle Membership, please contact the Advancement Department at: give@tmmc.org or call (415) 289-7335.